What’s the Deal: It’s cherry blossom time in the nation’s capital, and The Liaison Capitol Hill, an Affinia Hotel, invites guests to experience its newly redesigned restaurant, Art and Soul, and refreshed lobby, and to sample the new menu with the Artisanal Fare Escape. Background: The closest hotel to the U.S. Capitol, The Liaison Capitol Hill, an Affinia Hotel is just steps away from Union Station and the National Mall’s world-famous monuments and museums The newly redesigned Art and Soul, Celebrity Chef Art Smith’s restaurant, is a Southern-inspired eatery that has re-opened after a complete transformation of the dining area, bar and private dining room. The new look features natural and rustic elements, complementing a tasty new farm-to-table menu. 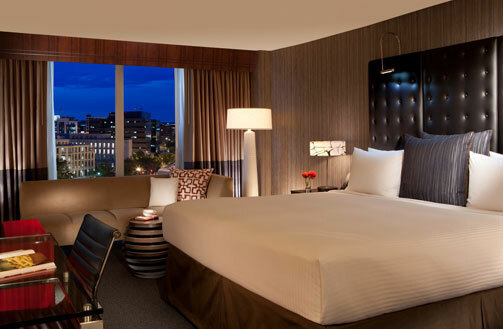 Details: The offer, which starts from $179 per night, is available for travel through Sept. 2, 2013 and includes accommodations in a recently renovated guestroom plus a $100 dining and beverage credit per night to be enjoyed at Art and Soul. Booking: Visit www.affinia.com/NewArt or call 866-246-2203 and mention promo code NEWART. Shame, we tried to book this deal and got told that the dates we needed where not available. Think this is a real scam, shame on them! I hope you are well. I work at The Liaison Capitol Hill and would be happy to speak to you about the problem that you encountered. If there was no availability, that most likely means that we are already sold out. I’d like to know if you have any other dates you are open to? Please email me anytime at TBarba@affinia.com.